Giants win 2-1 over A’s in 10 innings. In my years as a Giants fanalyst, I’ve been outspoken about one thing above all else: Ryan Vogelsong is not a long-term replacement for Barry Zito. He doesn’t have any sort of track record that would indicate that he can sustain success, and despite Barry Zito’s poor start, he’s still a league-average pitcher who fills out a 4th or 5th starter spot pretty darn skillfully. Well, make room on the Vogelstrong bandwagon, because I’m throwing that out the window. Ryan Vogelsong looked amazing tonight, and Bruce Bochy and Brian Sabean are going to have some pretty tough decisions to make when Barry Zito returns. 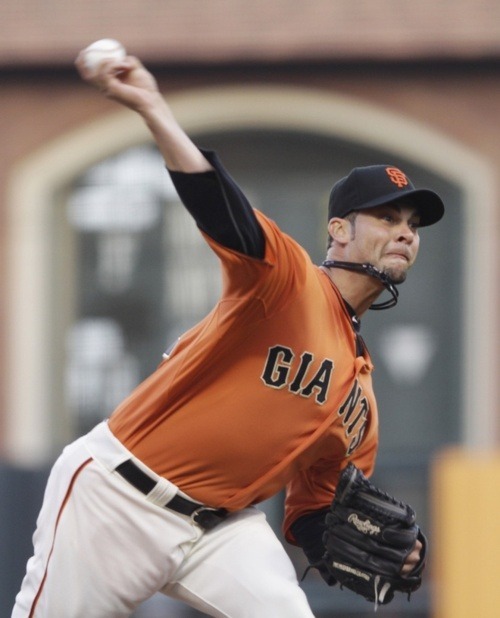 I do believe that Vogelsong is going to regress back to below his current god-like 1.93 ERA, and that Zito will perform better than we saw earlier this year, but you can’t deny that Tweety Vogelsong has made a case for a spot in the rotation. I do think that A’s fans should lighten up on the anti-Bob Geren hate. I think it’s important to remember that so much of baseball comes down to a few inches one way or another deciding a game, and that very little of that has to do with the manager. I heard people giving Geren grief for burning Hideki Matsui to bring up Conor Jackson with a runner on third, but Jackson hit the ball well, and only a brilliant dive and throw by Freddy Sanchez saved the run. If Sanchez had been one step over to his left, or if the ball had been another foot away from him, or if one of any number of intangible circumstances had been just slightly different, the run would have scored, and Geren would have gotten credit. I don’t think it’s especially fair to say that he made a major mistake that cost the A’s the game. I think it really comes down to play-style, and in general if the team wants to play it conservatively or aggressively. You can say that every hitter and run is precious because of the anemic offense, but that can be used as justification for either running more — get runs when you can, because you can’t trust the rest of the lineup to get hits — or running less — don’t risk wasting baserunners on steals and stretching hits. If Nate Schierholtz’s throw to gun down Josh Willingham early in the game had been just slightly slightly off, Willingham and Geren would have gotten credit for their aggressive play style. If Coco Crisp had successfully stolen home a few nights ago, it would have gone down as a great, aggressive play, not a foolhardy mistake. Plus, as much as people got on Geren for pulling Trevor Cahill earlier than necessary, it’s not like that had any effect on the game. Oakland’s bullpen is one of the best in the majors, and after Cahill went out they shut the Giants down until the 10th inning. Brian Fuentes may have had a bad result, but that at-bat against Emmanuel Burriss was epic. Outcomes shouldn’t always color our analysis of the decision-making process, though it’s really easy for them to do so. All in all, I think it was a good game. The A’s this year truly are the more extreme version of the Giants, with even better pitching and even worse hitting. I wouldn’t surprised if this wasn’t the last extra-inning, one-run game we see this series. This article was originally published on Standing Room Only, the FanFeedr sports blog.